Solitary lung nodules of <3 cm in diameter within the lung parenchyma and with no other abnormalities are often picked up incidentally during routine radiographic imaging. The incidence of cancer for such nodules has been estimated to be 10% to 70%. Management strategy depends on the clinical probability of cancer; nodule size, features, and growth rate ascertained by radiology; and the surgical risk to the patient. We report a case of such a nodule revealed by radiology and suspicious for malignancy. Subsequent excision and pathological examination revealed unexpected findings. The index patient was a 61-year-old Chinese man from Northern China with history of laryngeal cancer treated successfully by local surgery and radiotherapy 6 years prior to present admission. Routine chest computed tomography (CT) scan revealed a peripheral lung nodule 9 mm in diameter in the right lower lobe. Follow-up CT scan 1 year later revealed minimal increase in size to 10 mm and the patient was referred to the Department of Thoracic Surgery, University of Hong Kong–Shenzhen Hospital in November 2015 for further treatment. The patient was a former chronic smoker for more than 10 years (10 cigarettes/day) but had stopped smoking upon diagnosis of laryngeal cancer. Physical examination of the patient was unremarkable. High-resolution CT scan confirmed the presence of a peripheral lung nodule in his right lower lobe lateral-basal segment that was suspicious for malignancy. It measured 12 mm in diameter and had a spiculated border with a central cavity (Fig a). Another high-density 2-mm nodule was present in the right upper lobe subpleural region associated with apical fibrosis. There was pleural thickening and mildly increased peripheral lung markings in bilateral lower lobes. The peribronchiolar and hilar lymph nodes were not enlarged. After further examination and assessment of the surgical risk, video-assisted thoracoscopy was decided, with patient consent. During video-assisted thoracoscopy, wedge excision of the nodule was done. Intra-operative frozen section consultation revealed a 10-mm papillary glandular tumour 8 mm away from the pleura. There was profuse mucin production and intra-alveolar extension suspicious for mucinous adenocarcinoma. Right lower lobectomy was subsequently performed, and the patient had an uneventful recovery. Microscopic examination of formalin-fixed paraffin-embedded sections from the nodule showed an arborising papillary tumour (Fig b) surrounded by intra-alveolar mucin. There was extension along the alveolar lining at its periphery (Fig b, inset) simulating ‘lepidic spread’ of adenocarcinoma. The papillary structures (Fig c and d) consisted of fibrous cores covered by single to multiple layers of mucin-secreting and ciliated (Fig d, inset) columnar cells and basal cells. There was focal tumour necrosis, rare mitoses, and mild nuclear atypia. Mucin and inflammatory cells filled the central cystic space. Origin from a dilated terminal bronchiole could be traced (Fig e). A batch of immunohistochemical studies showed CK7+/CK20- tumour cells mostly negative for thyroid transcription factor-1 except at the periphery, suggestive of residual alveolar lining cells. Monoclonal carcinoembryonic antigen highlighted the mucinous cells and p63 stained the basal cells. Proliferative index by Ki67 was low (5%). The overall picture was consistent with ciliated muconodular papillary tumour (CMNPT) of the lung. Examination of the lobectomy specimen showed focal peribronchiolar fibrosis compatible with the effect of smoking.1 These foci often contained peribronchiolar metaplasia featuring ciliated and mucinous columnar cells (Fig f) occasionally forming small papillae (Fig f, inset). The 2-mm lesion in the right upper lobe was a fibrotic nodule. The patient was well 1 year after surgery. The term CMNPT of the lung was first used by Ishikawa in 2002 to describe a 1.5-cm peripheral lung nodule consisting of ciliated columnar cells, mucous cells and basal cells with papillary architecture. It was considered benign in view of indolent behaviour and bland-looking cells. Further reports by Ishikawa2 and others3 4 5 6 7 of similar tumours under various names (eg, solitary peripheral ciliated glandular papillomas, peripheral pulmonary papillary/glandular neoplasms with ciliated cells) supported this group of tumours as a specific entity that has not been included in the 2015 World Health Organization Classification of Lung Tumours.8 We searched the literature and reviewed 12 reports of 33 such tumours (online supplementary Appendix). Controversy exists whether CMNPT should be considered a benign tumour, a well-differentiated adenocarcinoma (in view of frequent intra-alveolar extension), or a spectrum of entities with possible progression. The consistent small size, slow growth rate, and lack of recurrence or metastasis after surgery support the benign nature of this tumour. Differentiation from mucinous adenocarcinoma is difficult for pathologists, especially during intra-operative frozen section, owing to the profuse mucin production and lepidic growth pattern. 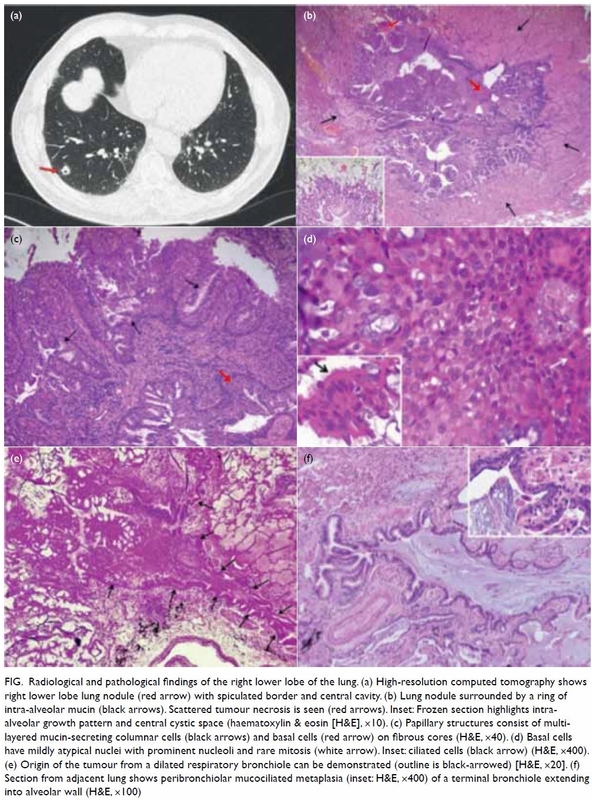 High-power examination revealing tripartite cell differentiation and lack of significant atypia in a clinically slow-growing lung nodule should raise suspicion of CMNPT. Wedge excision with clear margin is the treatment of choice. Our findings concur with a previous report3 of tumour origin from the terminal bronchiole. The finding of co-existing peribronchiolar metaplasia with similar cell components as CMNPT in the rest of the lung is unique. This suggests progression of disease from smoking-induced metaplasia to neoplasia during the pathogenesis. Although chronic smoking was noted in most male patients with CMNPT (14 out of 16 with smoking history specified in the online supplementary Appendix), co-existing peribronchiolar metaplasia was only briefly mentioned in one report,4 probably owing to limited sampling in wedge excision for most tumours. Molecular analysis for BRAF or EGFR mutations was not done in our case, because there was no therapeutic indication. Studies of CMNPT by Chuang et al5 and Lau et al6 yielded no KRAS or EGFR mutation. In contrast, Kamata et al7 reported mutations involving EGFR, BRAF, PTEN11, CTNNB1, IDH1, and TP53 in Asian patients and Liu et al4 reported mutations involving BRAF and AKT1 in one non-Asian patient. Because CMNPT is commonly reported in patients from East Asia, more reports are expected when awareness of this entity is raised among pathologists in this region. The pathogenesis, molecular characteristics, and natural behaviour of CMNPT can be better defined when more data are available. Concept or design: FMF Cheung. Acquisition of data: All authors. Drafting of the manuscript: FMF Cheung. The authors would like to thank Dr Siu-wah Pang for contributing to the diagnosis of this tumour. This study was approved by the Ethics Committee of the University of Hong Kong–Shenzhen Hospital as original work with no infringement of personal privacy. The requirement for patient consent was waived by the Ethics Committee. 8. Travis WD, Brambilla E, Burke AP, et al. WHO Classification of Tumours of the Lung, Pleura, Thymus and Heart. Lyon, France: International Agency for Research on Cancer; 2015.